Legendary Brooklyn MC Guru -- half of the infamous hip-hop duo Gang Starr -- is in a coma after suffering from cardiac arrest this weekend. Guru's sister broke the news explaining that her brother, real name Keith Elam, had to remain in the hospital due to complications from the heart attack. Details remain scarce on the rapper's condition but DJ Premier, Gang Starr's second half, phoned into Sirius Satellite radio station Hip Hop Nation to confirm the details that have been leaked so far. 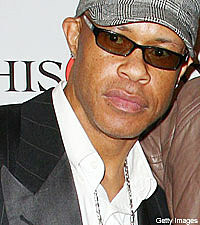 "Guru is in a coma and will go under surgery tomorrow afternoon," Premier said. Guru -- originally Keithy E. The Guru -- formed the pioneering hip-hop group Gang Starr in the mid-80s, teaming with Premier in the late '80s. The Brooklyn based duo's debut album was 1989's 'No More Mr. Nice Guy,' and they went on to release several successful albums. Guru's solo work includes four volumes of the Jazzmatazz series and he later launched both Ill Kid Records and 7 Grand record labels.